GUITAR TERZA RIMA are the Russian guitarists Victor Unukovsky & Adian Zolotuhin plus UK percussionist Buster Birch. They recently appeared to rave reviews at London's Southbank. "Like a great night in a European bar" - David Shaw-Parker, Musician Magazine. Round Midnight Quartet, featuring the husky vocals of Rebecca Dixon - reminiscent of Julie London and Diana Kraal. Steve Spall - Cool jazz guitar blended with Damian Coldwells's double bass. Paul Malsom acoustic guitar plays Brazilian Jazz, funk and groove with Andres Ticino on percussion and special guest harmonica player - Julian Jackson. Martin Nicholls, vocals with Nils Solberg on guitar ,<?xml:namespace prefix = u1 />Andy Lawrence on bass and Mike Piggott and violin. 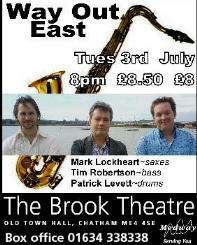 Featuring Jo Fooks, sax-Humphrey Lyttelton�s Band and Paul Malsom on acoustic guitar. <?xml:namespace prefix = o ns = "urn:schemas-microsoft-com:office:office" />A delicious mix of jazz and contemporary material �Beverley seduces the ears with her delicate and sultry vocal style, aided by fine unusual arrangements.� ~Derek Nash, sax-Jools Holland�s R&B Orchestra. ROUND MIDNIGHT feature sultry vocalist Becky Dixon, likened to Julie London & Diana Krall. 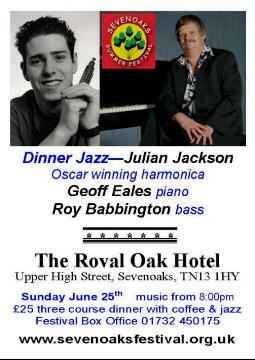 Dinner Jazz with Derek Nash saxophone and Paul Malsom guitar in The Royal Oak Hotel in the historic old centre of Sevenoaks. Julia Farino, a fine singer on the London scene, returns to The Grey Lady for the with the pianist Dave Ramm. Wonderful singing with entertaining repartee. Kenny Ball and His Jazzmen on stage at The Mick Jagger Centre. Click for YouTube video taken at the event. Beautiful soulful singing from Rachel Munro with Carl Greenwood on piano, Terry Pack on bass and Special Guest: Tony Cameron on trumpet. 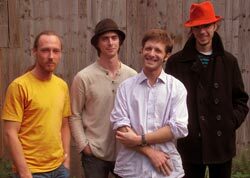 FILTHY SIX - Jazz Soul Band, featuring Mark Brown of Basement Jaxx. There will be space for those compelled to dance. YOUTUBE video taken at the gig.